When I arrived at the bank of the Salmon River, the view reminded me of the fall of 2016. The water levels were the same, visibility was the same, and the movement of the fish was the same. I looked downstream over the riffle that pours into the Joss Hole. Sure enough, every couple of minutes one or two King or Coho salmon would make their way through the heavy water, weaving in and out of rapids and pausing to rest occasionally. I waded across to the island that splits the river and continued moving downstream. I watched a half dozen fishermen hook into salmon as I walked by. I walked downriver until I reached the water that is sandwiched between the Joss Hole and the Spring Hole. Looking upriver at fishermen scattered in the early morning fog lifting off the water. It took thirty minutes until I hooked into my first salmon. 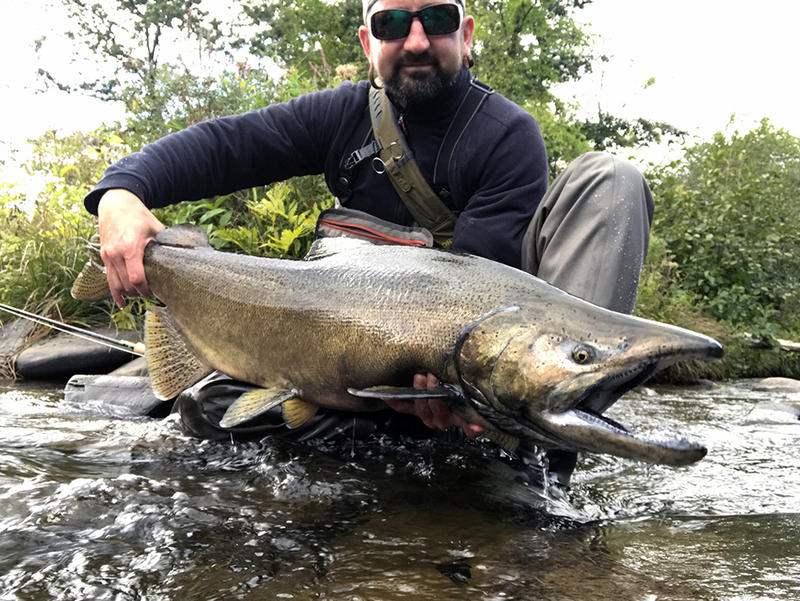 A large King took my Egg Sucking Leech pattern and ran downriver like a freight train. He put up a good fight but I quickly remembered how using 2X tippet makes landing a salmon twice as difficult. My line snapped after the giant swam over a rock and the fight was over. It wasn’t until late morning when I moved back to the riffle above Joss Hole that I finally hooked and landed by first salmon of the day. I found a soft riffle where the fish were waiting to make their next move upriver. I hooked into three fish in less than fifteen minutes and landed all three. All were King salmon over 30” in length, all in excess of 20lbs. The first King salmon I caught on Saturday morning. A large male King I caught using an egg pattern. The beautiful autumn colors of an east coast spawning run King salmon. As the afternoon wore on, I worked my way upstream. 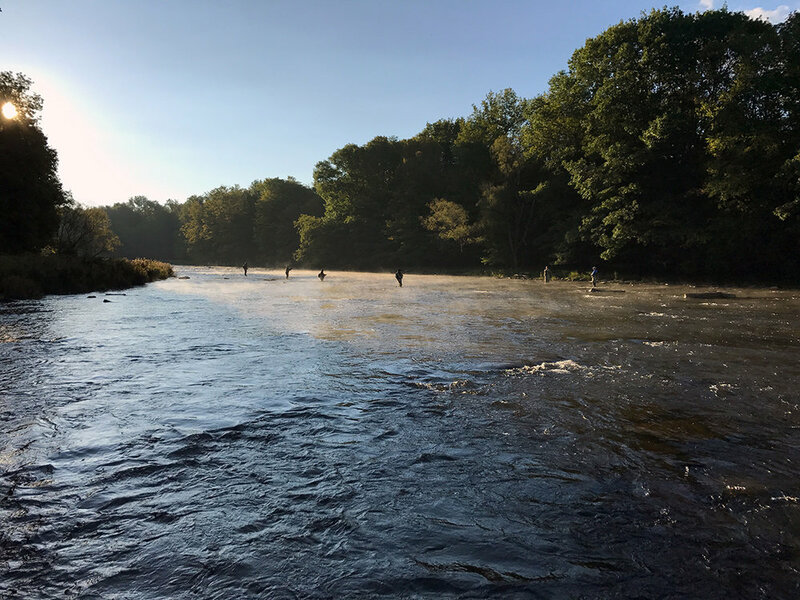 Often times during a good push of salmon, the fish will hold in deeper water during the middle part of the day, especially with sunny skies. If you are able to get above the fish, you can target them as they begin to again move upriver as the lowlight conditions of evening come about. I positioned myself on a riffle on the upper portion of Douglaston’s middle section. Around 5:00PM the fish started moving. I started drifting my Egg Sucking Leech down into a tailout and a large salmon grabbed my line and nearly yanked my fly rod out of my hands. I fought this fish for 15 minutes in the last light of the day and landed him. I was able to snap a picture before sending him on his way. The Salmon River running at 350CFS. The next two days, the salmon fishing was the most consistent I’ve experienced in a long time. The fish moved from sunup to sundown, but not in large pods, mostly three or four at a time. On Sunday a large number of Coho entered the river and I was able to finally hook up and land my first “silver salmon.” This was a thrilling experience. The Coho salmon, although not as large as the King salmon, pack a lot of power and is why fishermen desire catching them. One of the Coho salmon I caught on Sunday afternoon. The first Coho I hooked up with made a blistering run and left a bird nest in my Lamson Guru HD fly reel. I also had the unique opportunity to hook a Coho that had a sea lamprey attached to its side. I wasn’t sure what I was looking at until I had the fish beached on the rocks and watched the lamprey detach itself and begin wriggling around on the bank. Sea lampreys look like a creature out of a horror film with their round mouths that are full of backward facing sharp teeth. You can catch a quick glimpse of the lamprey I caught in the video above. A giant King salmon that took me for a long walk down the river. On Monday my friend Bob Buzzard joined me to capture some high quality photos and video of the salmon run. I’d asked Bob to get his fishing license so that we could attempt to get him his first salmon on a fly rod. After a brief lesson on drifting nymphs, Bob was off and fishing on his own. It wasn’t thirty minutes in and he hooked up with his first salmon. Unfortunately hooking up is only half the battle. His first salmon made several quick runs and broke the line. Bob had several chances to land salmon, including one opportunity with a Coho that came painfully close, only to end with a failed attempt at a tail grab. Anyone who’s fished for salmon knows that a tail grab on a Coho is an entirely different ballgame than a tail grab on a King. It wasn’t until the last half hour of light on Monday during a serious late afternoon run that Bob finally hooked and landed his first salmon. He was thrilled to lift the large male to the camera. After releasing the fish, we took a few photos of the Salmon River sunset and then hiked off the river using whatever remaining light was left to find our way back to the trail. Bob lifting up his first King salmon on any tackle, just happened to be a fly rod! 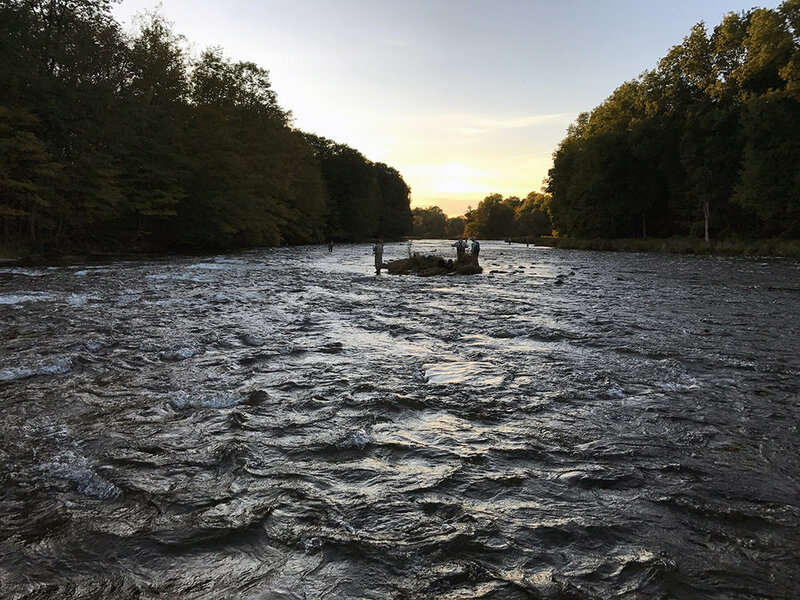 The Salmon River at sunset on Monday evening.